Frame on restoration of the British boy racer! This car has been updated throughout and now drives and looks better than it did when leaving the factory! 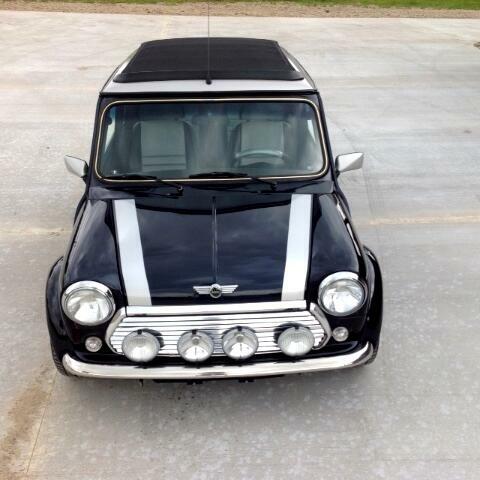 1970 Mini Cooper Sport 500 RestoMod Fuel Injection 1.3 Liter / 90 bhp 4-Speed Manual Transmission Front Disc Brakes Rear Drum Brakes The Model - The Iconic Mini was born of a partnership and would continue to improve as further partnerships were made. In order to save the businesses after World War II, Nuffield Motors and Austin came together to produce the Mini. As a gas shortage was occurring, the shift to smaller cars with smaller engines had begun. These little cars would still be expected to pull their load, in the case of the Mini that meant transporting four adults that would have a combined weight totaling more than the entire weight of the car. The next partnership would bring racing great John Cooper into the mix. With the use of his 1275 cc engine, the Mini would be transformed from a casual compact car to a sporty microcar that has since become a centerpiece of automotive history. The Car - For all intent and purposes, this Mini Cooper is a essentially a modern final edition of the classic mini coo-per. The last series of Mini Coopers built before production was ceased overseas in 2000 was called the MK VII. Fitted with modern amenities such as the largest fuel injection 1275 cc engine, air bags, electronic controls, alarms system, modern brakes, upgraded suspension and even leather interior, this Mini Copper was restored to the exact specifications of the best and last production model of the iconic micro car. This outstanding example will bring a smile every time its driven to even the most discerning collector.